This recipe for an easy pecan roll makes eight delicious nougat-style logs, covered in creamy caramel and crunchy toasted pecans. Traditional recipes call for the nougat and caramel to be homemade, but this recipe makes use of prepared marshmallow cream and caramels to cut down on preparation time. The result is a sweet treat that is bursting with pecan flavor. In a large bowl, combine the marshmallow cream, powdered sugar, and vanilla extract. Divide the candy into 8 equal parts, and roll them into thick logs about 1” in diameter. Place the logs on a baking sheet lined with foil or waxed paper, and freeze the logs until very firm, at least 1 hour. Once the logs are very solid, place the unwrapped caramels in a large microwave-safe bowl with the cream. Microwave for one minute, then stir the caramels. If they have not all melted, or if it is still very stiff, microwave for an additional brief period. Stir until the caramel is smooth and homogenous. 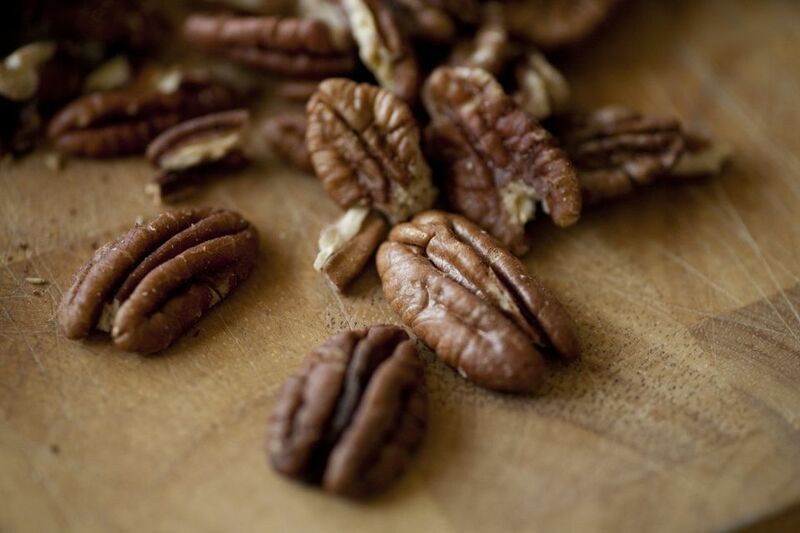 Place the chopped pecans in a shallow bowl or pie tin. Remove the logs from the refrigerator. Using a fork or dipping tools, dip one in the melted caramel until it is completely submerged. Remove it from the caramel, then place it on the chopped pecans, and roll it in the nuts until every surface is covered with nuts. Replace the log on the baking sheet and quickly repeat with remaining logs. If the caramel gets too thick, microwave it again briefly until it is smooth and liquid. Once all of the logs have been coated in caramel and nuts, return them to the freezer for 30 minutes. Once they are firm, they can be cut into beautiful round slices. To serve, place the slices in small candy cups. Pecan Roll can be stored in an airtight container in the refrigerator for up to a week. Be aware that if it gets too warm, the caramel will soften and may not hold its shape.